The State of Georgia currently holds 63 miles of the Chattahoochee River between Atlanta and West Point Lake to a lower protective standard for water quality than other sections of the river. Fixing this problem requires Georgia’s Environmental Protection Division (EPD) to update the Designated Use for this river section to include Recreational Use. The Chattahoochee downstream of Atlanta is dramatically cleaner than it was when CRK first stood up to protect the river two decades ago. Once severely polluted, the stretch of river from Atlanta’s wastewater discharge at Peachtree Creek down to West Point Lake has rebounded significantly and riverside communities have taken note. Each year, hundreds of people fish, paddle, swim, canoe and wade in this part of the river. New initiatives promoting river access are emerging everywhere from west Atlanta down to Franklin and West Point Lake. And yet despite this resurgence in river recreation, the state of Georgia holds most of this 76 mile section of the Chattahoochee to its lowest protective standard for water quality. CRK has been working to change that. part of river was dramatically impacted by pollution. EPD claims that not enough people spend time on this part of the river to merit updating that designation, but our research shows otherwise. At the beginning of 2018, we appealed to EPD to update the Designated Use of this section of the Chattahoochee to include Recreation. We documented over 1,800 paddlers on this river section from 89 trips organized by CRK and other organizations. Residents along this section voiced strong support for our request, and we provided EPD with over 500 signatures and comments from residents who described their experiences swimming, paddling and fishing on this part of the river (Click Here to Read our Letter to EPD). Fortunately, EPD took notice. With a step in the right direction, the agency recently redesignated 13 river miles near Chattahoochee Bend State Park to include Recreation. That leaves 63 miles to go. The remaining river miles flow past Cobb, Fulton, Douglas, Carroll, Coweta and Heard counties, and CRK believes that residents of these counties deserve access to a Chattahoochee with the same protections that the river has further north. Now is the time to update the Designated Use of the Chattahoochee River between Peachtree Creek and West Point Lake to be consistently designated for “Recreational Use,” and you can help make that happen. 1) Add your name to our request to EPD using the form above. 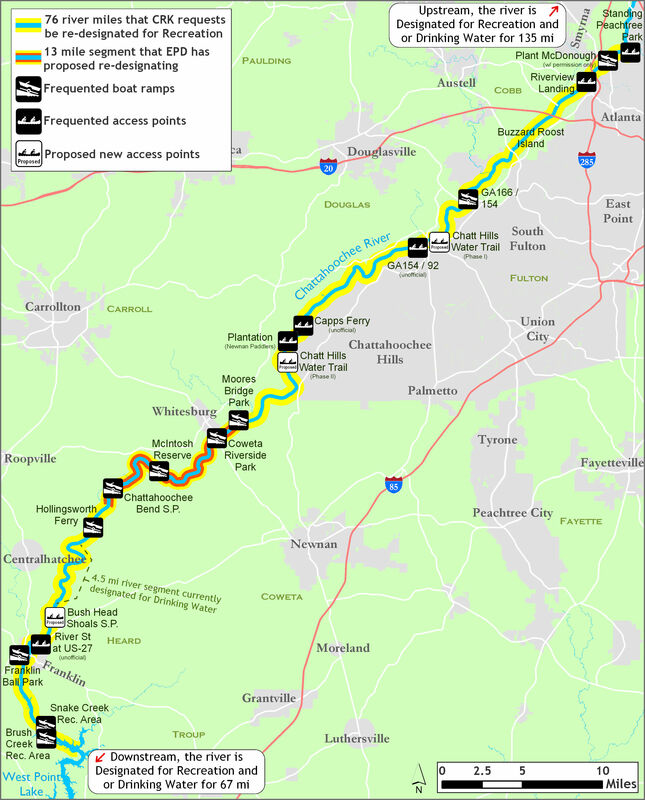 2) If you live in Cobb, Fulton, Douglas, Carroll, Coweta, or Heard county, ask your city and county representatives to encourage Georgia EPD to update the Designated Use of the entire section of Chattahoochee between Atlanta and West Point Lake to include Recreational Use. 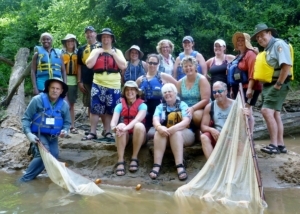 3) If you or an organization you are involved with has spent time paddling, wading, swimming in, or exploring this part of the Chattahoochee? Let us know at efyfe@chattahoochee.org – 404.924.4500. 4) Spread the word! – The more feedback that EPD receives about people who recreate on this section of river, the more likely the agency is to update the Designated Use. Share this link with your fellow paddlers, friends, and family.